Spent nearly $1 million on Walker’s losing campaign, still has major power with legislators. 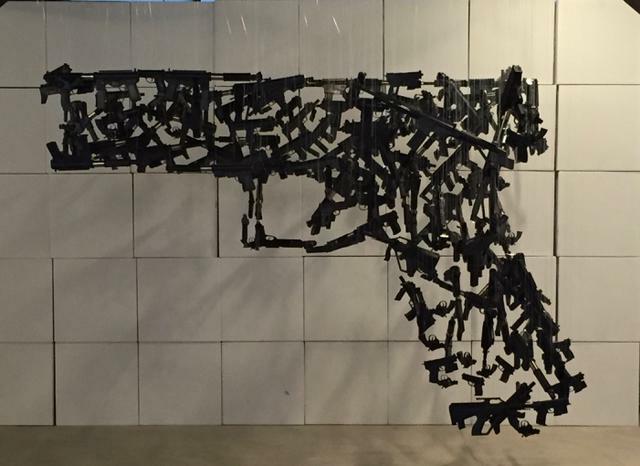 Hanging sculpture of guns. Photo by Craig Mastantuono. In Wisconsin, the National Rifle Association spent just over $1 million in 2018 on electioneering activities in legislative and statewide elections. It was one of only a handful of powerful special interests to surpass the seven-figure mark for election spending last year. The pro-gun group has been a dependable backer of Republican and conservative candidates in Wisconsin state elections for years. All told, the NRA has spent more than $5.5 million between 1998 and 2018 on independent expenditures to support Republican and conservative candidates. More than $4.4 million, or 80 percent, of the NRA’s election spending between 1998 and 2018 in Wisconsin was to support Republican Gov. Scott Walker, including more than $940,000 last November when Walker lost reelection. The NRA’s outside electioneering is generally television and radio ads and mailings. To view the outside electioneering activities the NRA sponsored, and the candidates it supported and opposed between 2008 and 2018, check out the Democracy Campaign’s NRA profiles –here, here, here, here, here, here,here, here, here, and here. The NRA’s direct contributions and independent expenditures are made through its longtime state political action committee (PAC), the NRA Political Victory Fund, as well as a federal PAC of the same name, and a corporation called the National Rifle Association of America. In 2015 and 2016, the Citizens for Responsibility and Ethics in Washington (CREW) filed complaints with the U.S. Internal Revenue Service and Federal Election Commission alleging the NRA failed to report nearly $60 million in political spending between 2008 and 2014. In addition to its outside spending on behalf of candidates, the NRA Political Victory Fund made another $110,250 in direct contributions to Wisconsin candidates between 1998 and October 2018. The group’s support for Republican legislative and statewide candidates has paid off handsomely. Since 2011, Walker and majority Republican lawmakers have approved numerous controversial laws sought by the NRA, including concealed carry; elimination of the 48-hour waiting period to buy a gun; legal protections for people who shoot trespassers inside a home, business or vehicle, also known as the “castle doctrine”; creation of a wolf hunting season; legalization of switchblade knives; more prohibitions on interfering with hunting, trapping and fishing; making it more difficult to close shooting ranges; allowing children of any age to enroll in the state hunting mentorship program; and creation of a speedy process authorities are required to use to return seized firearms to their owners. Walker and majority GOP lawmakers have also repeatedly ruled out changing any of Wisconsin’s gun laws, even in the aftermath of the 2016 Orlando nightclub shooting that killed 49 people and injured 53, or the Stoneman Douglas school shooting in Parkland, Fla. last year that killed 17 and injured 17. Walker and Republican Assembly Speaker Robin Vos dismissed the claim that stricter gun laws would prevent such incidents. Some Republicans said gun laws should be loosened even further to allow people to carry guns in public schools and on college campuses. If there were fewer vehicles on the roads there would be fewer accidents.